Water Remediation Services, NJ and PA | The Basic Waterproofing Co. Since 2009, we have helped our basement finishing customers remedy their water-related issues through The Basic Basement Co. We received so many customer requests for waterproofing services that we created a company with a dedicated staff to best serve our customers’ needs. Like all TheBasicCompanies.com services, we are committed to providing customer service and quality installations at an affordable cost. Having water-related issues in your basement can cause stress which can lead to rash decisions. Our qualified staff will take as much time as needed to understand the root cause of the problem and develop a solution. Our teams put in the extra effort necessary to make you feel comfortable that the decision you make to solve the problem was the correct one. We look forward to servicing your needs. As part of your interior basement water remediation solution, we will install a sump pit to collect water from your interior drain system and a sump pump to discharge the collected water out of and away from your foundation. We also provide battery back-up sump pumps as part of your system design to ensure the prevention of water damage during power outages. 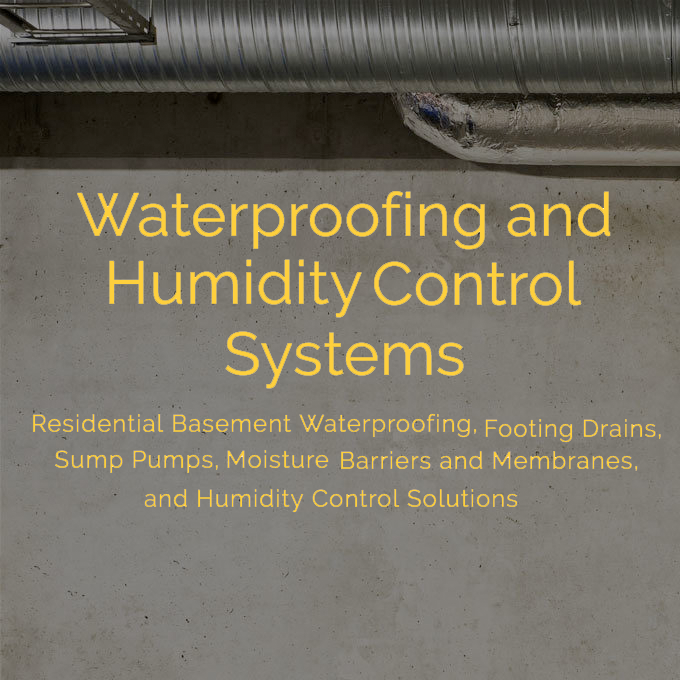 Our waterproofing and water remediation experts will design and install a system to prevent water from penetrating your basement’s exterior and divert run-off and groundwater away from your foundation. We will carefully excavate around your home’s foundation to access the exterior basement wall and footings and build a system that will keep your basement water-free. Damage to the foundation of your home caused by age, settling, improper installation, and water can impact it’s structural integrity. We will inspect your foundation to determine the best approach for correcting the damage done to your basement. Our experts will design a solution to ensure your home’s foundation is structurally sound. We install humidity control devices that lower the humidity level in your basement to a point that doesn’t allow for mold growth. The materials used for our interior water management systems will alleviate any mold that currently exists in your basement. The Basic Waterproofing Co. provides professional basement waterproofing, water remediation, and structural repair solutions throughout New Jersey and Bucks and Montgomery counties in Pennsylvania. Contact us to schedule your free, in-home consultation.